In today’s world of competitive koi shows the Asagi koi variety is still ranking in the champion categories on a regular basis, across a wide spectrum of koi shows around the world. The Asagi koi variety even has very strong showings in the world class All Japan Koi Show. This is pretty impressive for the Asagi considering all the razzmatazz and hubbidydoo that surrounds many of the “newer” varieties of koi, all this new artwork/koi that has been created. With its long history making the Asagi the “original” ornamental carp, the artwork of the Asagi koi variety still stands the test of time as the nishikigoi hobby heads towards its 200 year mark. POND DECORATING CAN EXTEND YOUR POND ENJOYMENT! 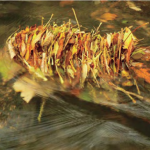 By: Mike Gannon | Posted On: November 2nd, 2009 | No Comments on POND DECORATING CAN EXTEND YOUR POND ENJOYMENT! As a New Jersey pond guy I am always looking for ways to encourage my pond customers to enjoy their ponds and water gardens or extend the enjoyment of their pond in the areas like the northeast where many ponds go through a “shut-down” period. 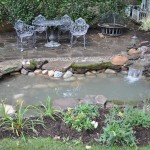 A great way to extend the enjoyment of a pond installation is decorating around the pond. In many neighborhoods one can see all sorts of seasonal displays pop up on front lawns; often times a hay bale with some cornstalks or other seasonal items. This type of display is great to extend to the pond. Sure the aquatic plants have stopped growing so how can you add visual interest to the pond? Add a seasonal display by using some nice large pumpkins, gourds, a hay bale. When Halloween rolls around try some carved, lighted jack-o-lanterns, and other spooky seasonal items, a scary skeleton pond side is great fun for the kids. For Thanksgiving and Christmas time add some lighting, a few strands of mini lights around a pond can really add quite a bit of dimension and beauty to the setting or put a banner of your favorite football team by the pond!